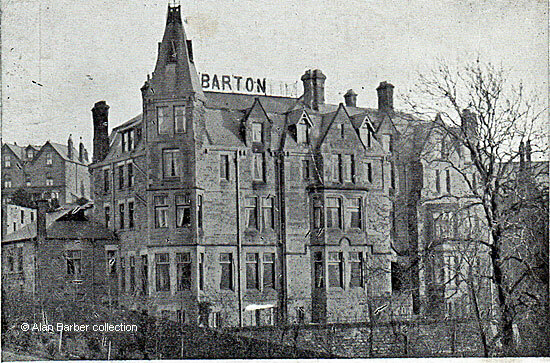 There was no mistaking George Bernard Barton's Dalefield Hydropathic on Matlock Bank at the beginning of the twentieth century; his sign would have stood out for all to see. This was and still is a large and flamboyant Victorian building on Chesterfield Road, built in a mixture of Gothic and Romanesque styles. The architect was J. James Turner and L. T. Wildgoose was the contractor, with the interior furnished by J. T. Wall of Matlock Bath and a Manchester firm. It was built of local stone, with the northern end being five storeys high whilst it was four at the southern end[a]. The land was first offered for development in 1859 when a sale notice for Dale Field, Matlock Bank, divided the plot into two Lots and described it as valuable freehold and copyhold land. "The lands in Matlock Bank are very eligibly situated for building purposes, and are in the immediate vicinity of the far-famed Hydropathic Establishment of John Smedley, Esq.". "Dalefield" was then built and Mr. Thomas Stevens was the owner. "Dalefield" was advertised both for letting and for sale around 1882 and the sale notice once more advertised two Lots. The main house was described as having seven bedrooms and, together with the gardens, which also including an orchid house, covered "an area of 2,476 square yards or thereabouts". There was a further Lot of building land, which was 1,071 square yards. This is likely to be when Mr. Barton bought Dalefield; he was definitely living there in a few years later, so the original house would have been demolished between 1887 and 1890. The hydro opened at Whitsuntide in 1891. The grounds contained two terraces, the one at the front being forty yards long. Lawn tennis courts were on the second terrace and they were surrounded with walks "interspersed with prettily arranged flower beds and pasture". George and Deborah Barton were described as genial hosts when the hosted a children's New Year party in 1893. There were a large number of guests, including some of the more affluent of the town, but it was also attended by a children living in Matlock and neighbourhood. When Deborah Barton died in 1897 an obituary notice said that during the thirty years or more she had been a Matlock resident she was much respected. Her husband George Barnard Barton was interred in the Matlock Parish Churchyard on 4th January 1909 and it was said that he was one of the founders of hydropathy. Tennis on the second terrace, Dalefield, 1903. From Abel Heywood's Guide. This does not show the retaining wall. 1. "Dalefield Hydropathic, Matlock Bank". No publisher. Posted 25 Sep 1904 at Matlock Bridge to a Mrs. Jenkins in Bridgend. The message was advising what time the sender would arrive home. In the collection of, provided by and © Alan Barber who is one of Mr. Barton's descendants. 2. Part of an advertisement published in Heywood, Abel (1903) "Abel Heywood's Guide Books, With Cycling, Walking and Driving Routes. Matlock Illustrated." "The Derby Mercury", Wednesday, October 11, 1882 - sale notice for Dalefield. 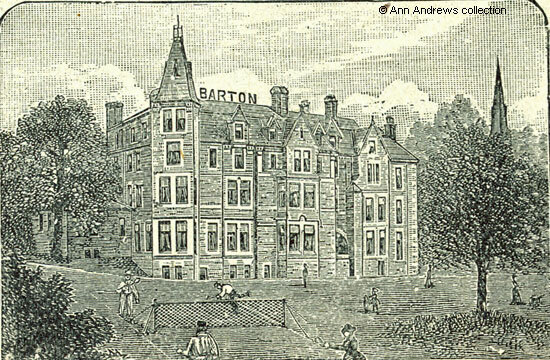 "Kelly's Directory" of 1887 shows Mr. Barton living at Dalefield. As it would have taken more that a few months to build such a big property (colossal was a word used to describe it) it is assumed that demolition and rebuilding could have begun in 1890. "Derbyshire Times and Chesterfield Herald", 30 May 1891. Dalefield opened. In the July of 1891 it was described as recently built. "Derbyshire Times and Chesterfield Herald", 7 January 1893. Children's New Year Party at Dalefield. "Derbyshire Times and Chesterfield Herald", 11 December 1897. "Sheffield Evening Telegraph", 5 January 1909.